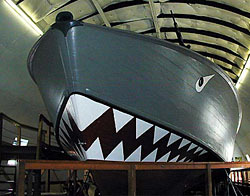 Built in 1945 by the Higgins Company of New Orleans, Louisiana, PT Boat 796 was intended for service in World War II. PT (Patrol, Torpedo) boats were small, fast, and expendable vessels for short range oceanic scouting, armed with torpedoes and machine guns for cutting enemy supply lines and harassing enemy forces. Forty-three PT squadrons, each with 12 boats, suffered an extremely high loss rate in the war.PT Boat 796 never served during the war and received the nickname "tail ender." 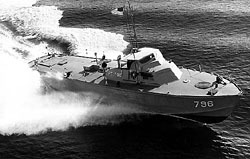 Assigned to a Navy ordinance testing station in Panama City, Florida, it performed high-speed towing work in the development of specialized equipment for Vietnam river patrols. PT Boat 796, a Higgins-type PT Boat, measures 78 feet in length, displaces 55 tons of water and originally carried a 14-member crew. In January 1961, PT Boat 796 joined the destroyer USS Joseph P. Kennedy, Jr. in Washington, D.C., and participated in President John F. Kennedy's Inaugural Parade. PT Boat 796 remained in use until it was decommissioned on July 7, 1970. It was obtained by J.M. "Boats" Newbury, the founder of PT Boats, Inc., a nonprofit organization of World War II PT veterans that restored and brought the vessel to Battleship Cove in 1975. PT Boat 796 along with PT Boat 617 are exhibited at Battleship Cove in Fall River, Massachusetts, the world's largest collection of historic naval ships, and remain the world's only restored pair of PT Boats. PT Boat 796, a National Historic Landmark, is located at Battleship Cove as part of the museum's historic vessel collection. Battleship Cove is located at 5 Water St. in Fall River, and is open to the public throughout the year for a fee. The times change slightly from season to season, and Battleship Cove is closed on Thanksgiving Day, Christmas Day and New Year's Day. For up-to-date information, please call 508-678-1100 or visit Battleship Cove's website.